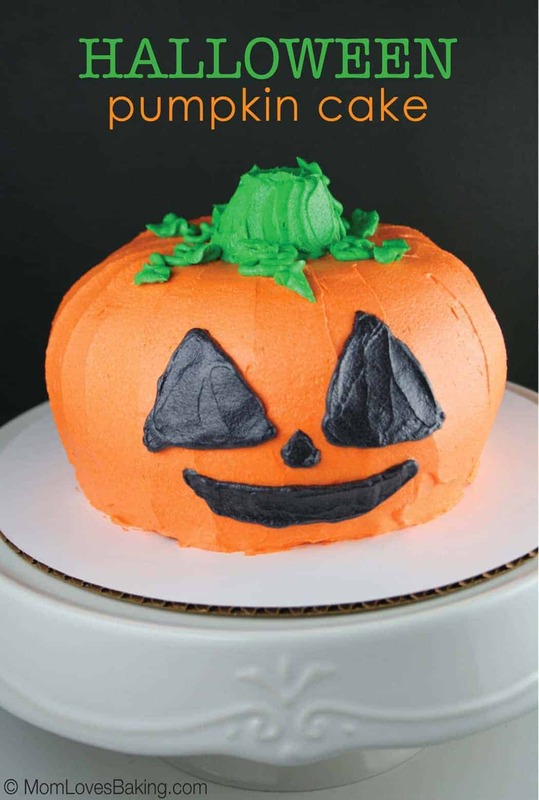 What’s cuter than a Halloween Pumpkin Cake? 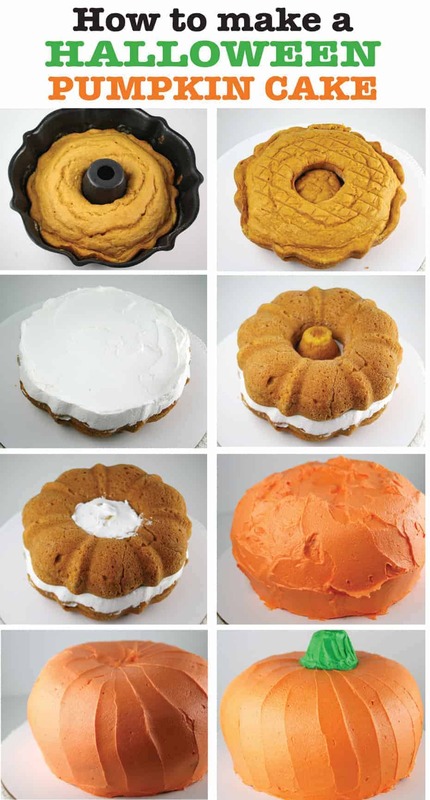 This one is easy to make with 2 bundt pans to create the pumpkin shape. It’s not only shaped like a pumpkin but it’s a pumpkin flavored cake too. I used 2 half-size bundt pans. If you don’t have those, then you could use 2 regular sized bundt pans and double the recipe. The cake recipe is easy. 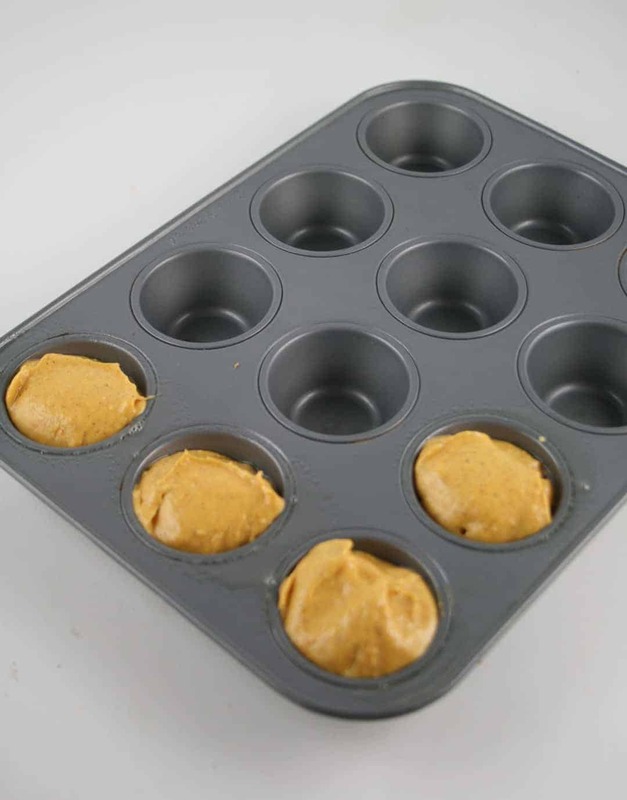 Just a few ingredients – a yellow cake mix, canned pumpkin, 1 egg, oil and spices. You’ll need to make 4 mini muffins too. You really just need 3 for the cake, but it’s always good to have an extra in case you mess up or maybe you would like to taste the fruits of your labor. Then fill the greased pans with equal amounts of batter. 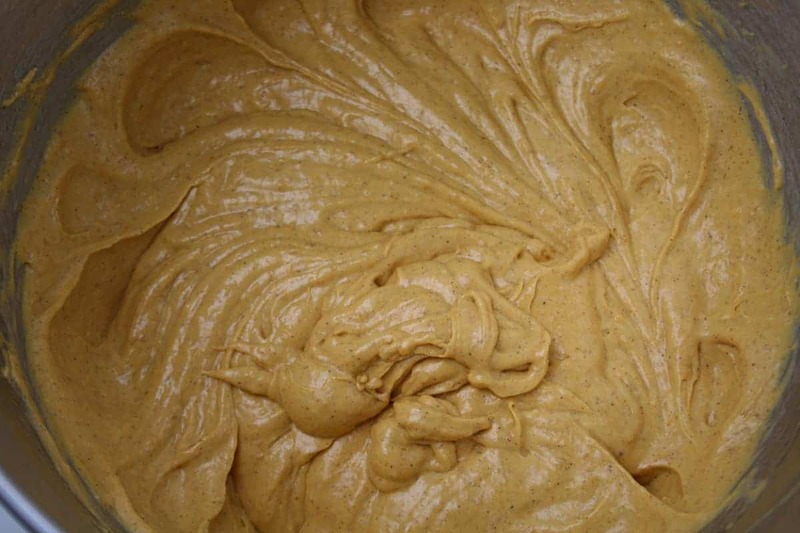 While the cake is baking, you can make your buttercream. Let cakes cool and frost as shown. You will put a mini muffin in the middle of each bundt cake. A third muffin will be the stem on top and one muffin is extra. You can initially put the orange icing on kind of messy. 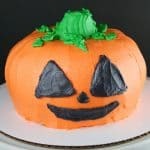 Then, once the cake is covered with a good amount of icing, use an offset spatula to spread the icing in an upward motion to create the pumpkin pattern. Use black buttercream to create the face. I made the cake for Fall Fest at my church – Alpharetta First United Methodist. They needed cakes for the cake walk. Well, guess who won the pumpkin cake. My daughter, Savannah. True story! 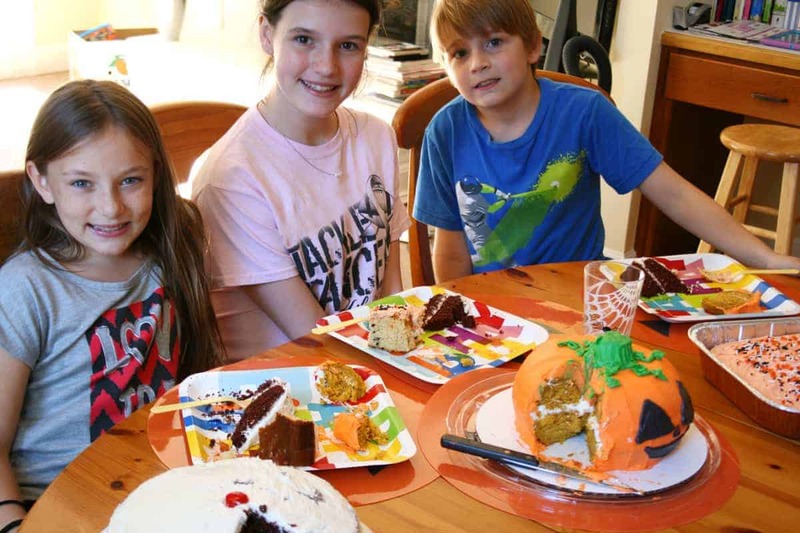 Ansley (a friend) and my son, Luke, each won a cake as well. So they decided to do a taste test. Any idea which cake won? 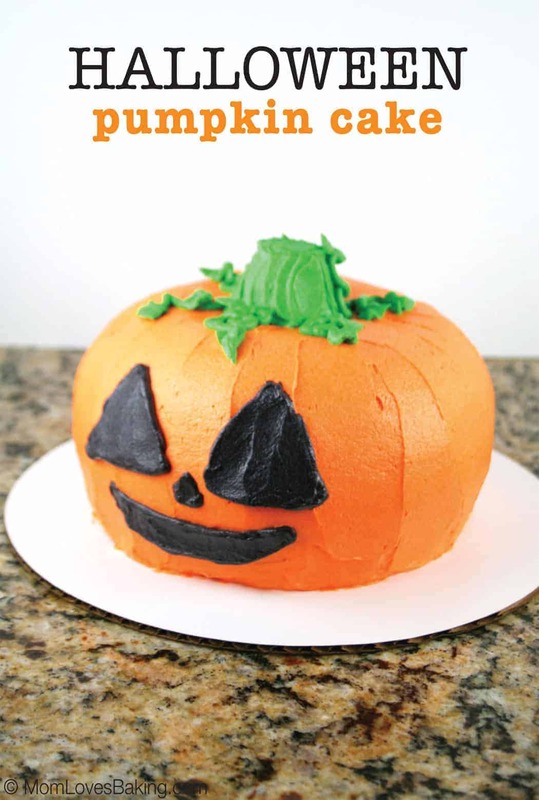 That’s right, the Halloween Pumpkin Cake. It’s kid approved, folks. Preheat oven to 350°F. Grease two half size bundt pans and one mini muffin pan. Set aside. In large bowl, place all cake ingredients. With an electric mixer on low, beat until ingredients are combined. Turn speed up to medium and beat for 1 1/2 minutes. Spoon about 2 tablespoons batter into each of 4 mini muffin cups. Pour the rest of the batter in equal amounts into prepared bundt pans. Bake mini muffins for 20 minutes. Continue baking cakes for 15-25 minutes (or total of 35-45 minutes) or until a toothpick inserted into middle of cake comes out clean. Let cakes cool completely. Place shortening in large bowl and beat with an electric mixer on medium high for two minutes. Add the butter and beat until combined. With the mixer on low speed, gradually add half the sugar. Add the milk and vanilla. Beat on low for a few seconds. Keep mixer on low and add the remaining sugar. Turn the mixer up to medium high and beat for 2 minutes. Add more milk if it's too thick. Put 1/4 cup of frosting in a separate bowl for the green and 1/4 cup in another bowl for the black. Keep the remaining frosting white for the time being. Place the first cake (rounded side down) on a cake board. Place a mini muffin in the middle. Frost the top of the cake. Place the second cake on top (rounded side facing up). Place another muffin in the middle. Frost the center only with white. Color the remaining frosting orange. Frost the whole cake with the orange frosting. A small offset spatula works great for spreading (I used Wilton Brand). Frost a mini cupcake with green frosting. Place on top of cake. (The fourth mini muffin is extra.) Create vines in green with the #5 tip and leaves with the #352 tip. Draw the face in black with a #5 tip. Store cake in the refrigerator. I’m having a fall-themed baby shower next month and this cake is going to be perfect!!! Wonderful idea! Thank you for sharing!! Will be trying this out..looks great n delicious! ! I’m slightly confused where the 4 mini muffins will go. I know one will be the stem. The other 3 I am not sure. Can you explain differently for me or have a pic? Thanks! I see the 4th is extra! Missed that the first time I read. So the other two are on the inside to help make the cake higher/bigger? Trying this for our church fall pig roast. Can’t wait to try it out. My cake is in the oven!! Hi, this is so cute and looks delicious! My only question is if you think it would be ok to substitute a cream cheese frosting instead of buttercream. Thanks! Do you have to cut or shape the cake? Or do you just apply enough icing that it looks rounded? Susanne: I wouldn’t use cream cheese frosting for this cake. It doesn’t work as well for decorating. Jess: I did not cut or shape the cake. I just used lots of frosting to fill in the middle and decorate the outside. How big are half size bundt cake pans and where can you find them? I only have the bigger size. How many servings are in 1 pumpkin?! About 12-14 servings, depending on how big you like your cake slices. This is just what I was looking for! Thanks for sharing. Soo CREATIVE! I am planning on making one bunt pan at a time(only have 1)so I am not sure do I add the wholecan of pumpkin and all if the spices to the box cake mix and then just split it in 1/2 for each cake?? 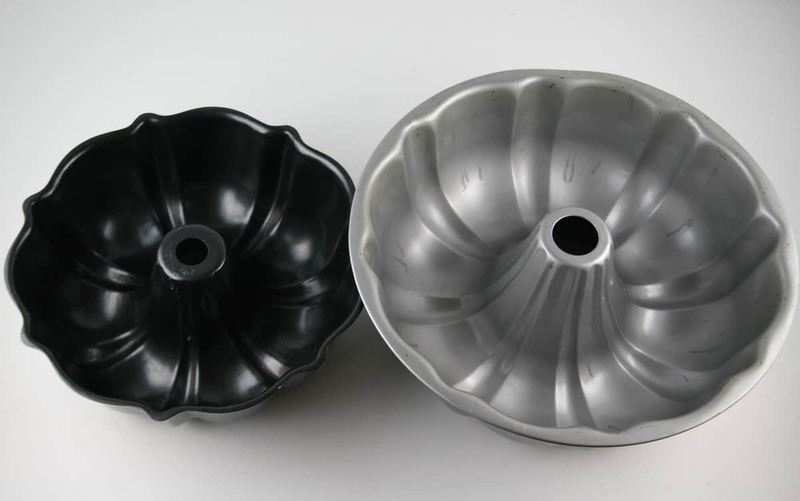 If you are using the full sized bundt pan should you use regular size cupcake pan? Should we also double the icing requirements? Yes to both questions. 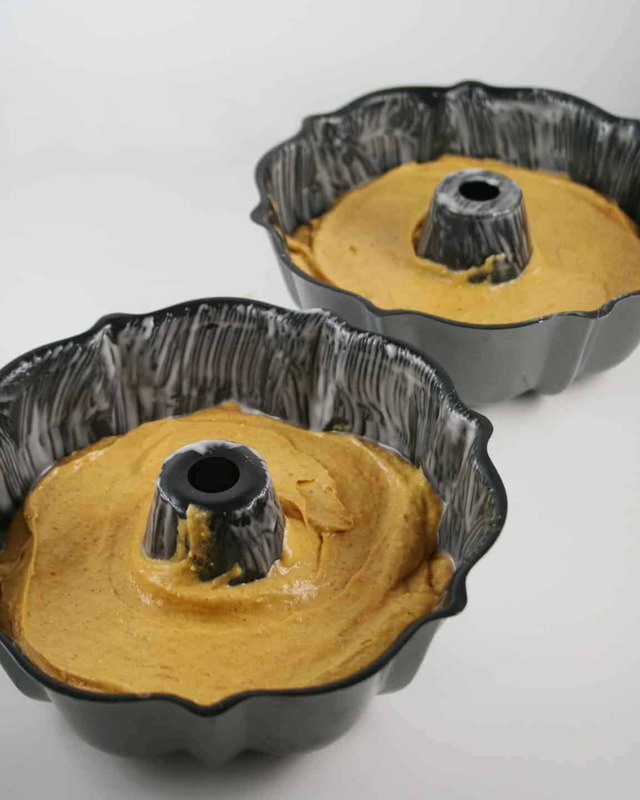 Double the icing and use regular size cupcake pan if using a full-sized Bundt pan.